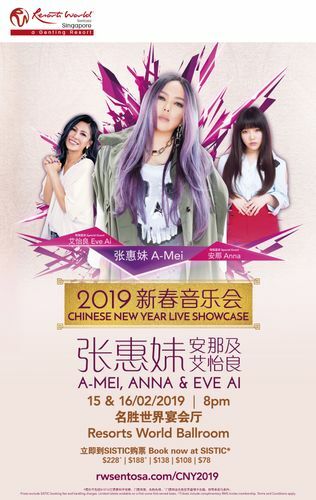 Resorts World Sentosa takes audiences to an all-time music high in a magnificent two-night live showcase, starring Queen of Mandopop A-Mei (Chang Hui Mei), “Queen of Blues” Ai Yi Liang (Eve Ai) and young starlet Anna. Over the years, the superstars have achieved a multitude of accolades, including Best Mandarin Female Singer at the Golden Melody Awards won by A-Mei and Ai Yi Liang. 18 year old Anna, who is also A-Mei’s niece, has built a strong reputation with her high-energy dance moves and infectious hits, earning the title “The Strongest Newcomer” by her fans. Together, the star-studded powerhouse trio will rock the stage at RWS in a music symphony of top hits and electrifying dance sequences. Limited tickets are available for each evening performance. Tickets to the showcase can be purchased online.